Saudi Arabia's March MERS count continues to climb with their 42nd, 43rd, and 44th case of the month announced this morning. While each comes from a different location, all three areas have recently reported surges in cases. 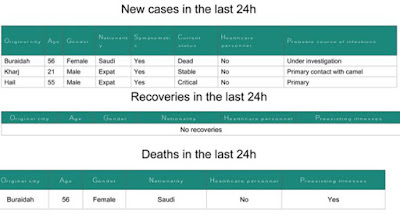 The fatal case, stated to be `under investigation', comes from Buraidah, where a community/nosocomial outbreak has infected 27 people, killing 14. We've seen several cases posthumously announced, raising questions over delays in diagnoses. A second case, from Al-Kharj, is listed as a primary camel contact, the third such case from that region in the past week. 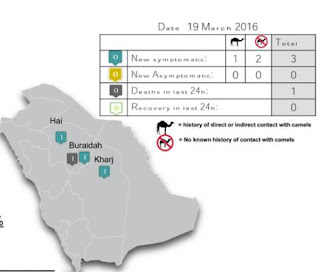 In February Al-Kharj was the site of several primary MERS cases linked to camel exposure, along with secondary cases. And lastly, we have the third case reported in less than two weeks from Hail, listed as a `primary' case. The two earlier cases this month were listed as `primary' and `under investigation'. Hail also saw a `primary' case in late February.